Just like printing, only better. Alphabet Soup, Inc. was started in 1978 as a graphic design, typography and prepress service bureau. Over the years, we have differentiated and diversified into a full-service Digital Imaging Studio. You might ask, what is a Digital Imaging Studio? All of our production is digital, which means, no film, no plates and especially, no hassle. Our background in the mechanics of file preparation and four-color printing have lent themselves to our rapid growth into a fully digital workflow. While others consider printing a commodity, we consider each job as an individual work of art that should garner the utmost attention. We not only can take your file and produce stunning results, but we also design impressive works from the ground up. Our philosophy has always been to create the highest quality product and to provide the best service available. We do this by investing in state-of-the-art equipment and having the most knowledgeable service staff anywhere. 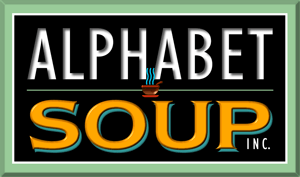 Alphabet Soup has the ability to produce almost any size or quantity of output imaginable. This includes, but is never limited to, poster-sized prints, grand format imaging, brochures, training and presentation materials, flyers, business cards or even one nice photo enlargement. Our quality is imprinted on each job.